"I am for this child - I am a CASA Volunteer"
CASA volunteers are trained community advocates who are assigned to abused/neglected children who are in Juvenile Court through no fault of their own. CASA volunteers have a court order that gives them access to the child and to all of their records so that the CASA volunteer can carry out an objective, systematic examination of the situation and determine the needs of the child. This is done by interviewing all interested and concerned parties to determine the facts and reviewing all records, documents, and clinical data. 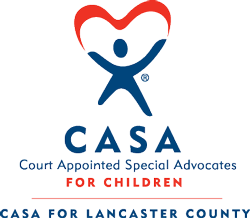 CASA volunteers get to know the child and communicates the child's wishes to the judge. CASA volunteers are required to attend approximately 30 hours of pre-service training and 12 hours of in-service (continuing education) annually and are supervised by a CASA staff person. If you are interested in learning more about becoming a CASA volunteer advocate or intern, please fill out the form below and we will contact you as soon as possible or you can fill out the application form by clicking on the link below. There is also a link with the schedule of our upcoming new volunteer training.